We are excited to announce the launch of a NEW curriculum - songs for seeds BIG KIDS. What is songs for seeds BIG KIDS? It is the same super fun (and educational) songs for seeds class structure. It is taught by the same awesomely talented songs for seeds band. It is enjoyed by the same awesomely talented kids – they’re just a little older these days (3-6 years old). songs for seeds BIG KIDS uses the structure of the songs for seeds curriculum – but changes 4 sections of class to meet the developmental milestones of this slightly older age group. Learn the days of the week (through song of course) and play a rhyming game with us. Join our drum circle and use visual math to practice counting. Rock out to our new tunes by your favorite band! We are excited to keep growing with your little seeds! 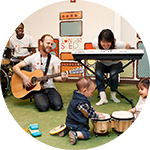 Named "Best Music Class" by New York Magazine, songs for seeds is a rockin’ music class that encourages kids to sing, play instruments (from drums and guitars to pianos and accordions) along with a live, three-piece band, as well as dance and move as much as possible. Kids travel around the world experiencing music and language from a new country every week. The band creates well-known nursery rhymes through art and song, does magic tricks as a way to practice numbers and counting, and spins the animal wheel to reinforce animal names and sounds. Kids will go home singing songs that you will like as much as them. Your baby will “fly” around the world experiencing music and language from a new country every week. 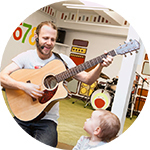 The band creates well-known nursery rhymes through art and song, practices numbers, spins the animal wheel to reinforce animal names and sounds, and plays peek-a-boo and other cherished baby games with your little ones. Your baby will be exposed to various rhythms, tones and activities to promote their lifelong learning through play and music. You’ll want to come to class each week as much as your baby! Take 30% off one child when siblings are registered for class. Take 40% off classes for twin b when twins are registered for the same class.